Back in the early 1980s, I had developed an abiding interest in two things -- comic-books, which usually feature superheroes, and the fantasy settings of authors like Tolkien and Donaldson. Therefore, in 1983, when Marvel Comics put out a 2-issue limited series comic-book called Red Sonja with a fantasy setting, I immediately found it appealing. I did not know at the time that Red Sonja was a character from the Conan novels -- I was never much of a Conan fan and I might not have bought the comics if I'd realized her provenance. I also had no idea, when the first two issues came out, that there would be no more immediately forthcoming. Nor did I know there had been a Red Sonja series some years before. What I knew was that here, at last, was a fantasy-based comic-book with good art and a good story. I was pretty upset when the series turned out to be just a two-for. +Marvel Entertainment followed up this two-issue series with another "continuing" series, but it was published sporadically, seeing only 13 issues printed in a 3-year period (ordinarily, even a bi-monthly title would have had 18 issues after 3 years). Because it was sporadic, I got a few issues (I think) but this series never managed to connect with me. However, ever since that two-issue Red Sonja series written by classic comic-book author Roy Thomas, I've always found the character, Red Sonja, interesting. She was billed as Conan's equal in prowess and fighting skill, and thus, other than the Barbarian himself, is the greatest warrior in the land. The fantasy setting is naturally appealing to me. On top of that, let's face it: Sonja's pretty hot (though in those days, they had stopped drawing her with the itsy-bitsy-teeny-weeny metal-scaled bikini armor). And so, when I started collecting comics again, I noticed right away that there are several Sonja-based ongoing series now being produced by Dynamite Entertainment. There is, of course, one titled Red Sonja: She-devil with a sword, as well as another called Queen Sonja, and a newer one called Red Sonja Unchained. There are also a bunch of other specials, one-shots, and mini-series that have been put out by Dynamite with Sonja's name. I decided to begin with the old stand-by, Red Sonja, and go from there. The Red Sonja series is now 6 years old and counting, and more than 70 issues have been produced. However, as with my other series reviews, I am going to review this one a year at a time. I will do this for two reasons. First, reviewing a 70+ issue series would make this article far too lengthy. And second, there's no guarantee I am going to keep reading it for 70+ issues (I've seen hints that after issue 36 or so, someone "different" takes over as Red Sonja, which sounds iffy to me, so I might stop at that point). Whether or not I branch out into the other "Sonja" titles remains to be seen, but so far, I don't plan to. As with characters like Batman and Superman, it's one thing to enjoy them in a monthly title, a single series. It's another to have to make a multi-title commitment to one character, when there are so many other interesting characters out there. Dynamite's Red Sonja series opens with a special "zero" issue, with a print date several months earlier than the first issue. I was not collecting comics at the time of publication, so I don't know for certain exactly why this issue was printed so far ahead of the others. Presumably this was a "test run" to see if they would sell enough copies to warrant a full series. Issue 0 can act as either a prologue to the story arc or an epilogue. Although it seems to have been printed first, and works very well when read first (as I did), chronologically (in terms of the story) the events of #0 occur after the events of #6. 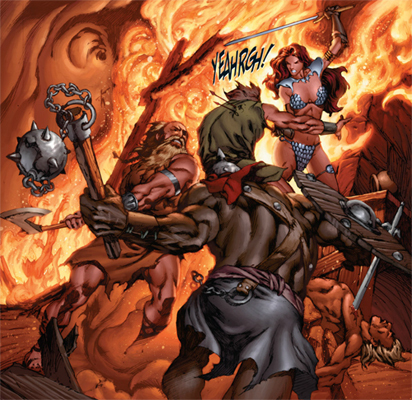 In #0, we hear of a "red storm" full of blades and fury - clearly, this is Red Sonja. This is a short-ish issue (several pages shorter than the standard length) and there isn't a lot of dialogue. In it, Sonja comes to a village, sees a girl with a strange pendant, and ends up tearing the village apart after she is attacked by the residents. Exactly why these events unfold is left unclear. The story really gets going in issue #1. Sonja begins searching for a city called Gathia, and she happens upon a messenger from there. The messenger is being accosted by a violent group of highwaymen, and Sonja rescues him, single-handedly slaughtering the brigands. She then helps the messenger get to Gathia. However, once there he drinks the water on the outskirts of town, which he says used to be cursed but no longer is, and comes down with the curse, turning into a monster and attacking Sonja. She is forced to kill him. She then takes his body to Gathia to return it to them, but they believe she killed the messenger, and they attack her. As the story continues, Sonja battles armies to a stand-still, and fights a giant troll. She is eventually captured, and the city's priest plans to sacrifice her to the local god at the request of the religious leader, called simply "the celestial." The story has many twists and turns, with Sonja battling her way through dungeons and across rivers, wading through armies, battling demons, and fighting monsters. Finally she ends up going against the celestial himself. She reveals that long ago, at his order, her entire village was slaughtered in the name of the celestial's "peace." This is what has motivated her to fight against him. When the story ends in issue #6, in classic Red Sonja fashion, pretty much everyone is dead except for her. She's defeated the celestial and freed the city from his iron rule, but the town burns around her, and the river runs red with the blood of many. 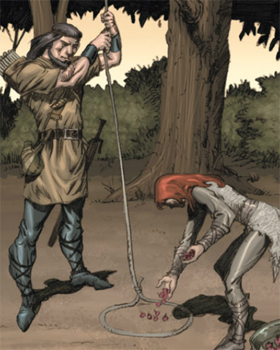 Indeed, as her thoughts narrate the ending sequence, she realizes that she's not called "Red" Sonja for her hair, but for the blood and death that she causes. When the comic ends, we see Sonja approaching the village from issue #0, following a girl who was the celestial's servant -- that's what the pendant signified in the opening sequence of #0. The story has come full circle, and now we know why Sonja laid waste to the town and everyone in it. 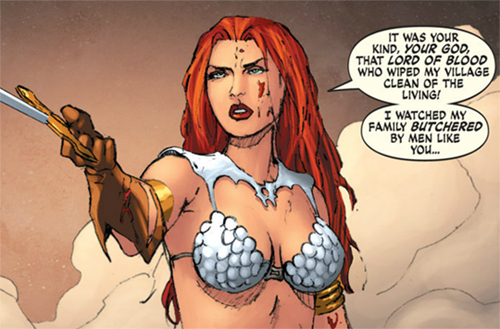 The second story arc for Red Sonja begins when she arrives at a familiar town, one she's visited before, and finds it devastated by brigands. She rescues a young girl from under a fallen statue -- a girl who's been raped and beaten -- and brings her to a shelter for treatment. When she hears about the brigands, she heads out to find them and exact revenge. Her encounter with the girl also brings up memories for her, so as Sonja follows the trail, we see flashbacks of her as a young girl, being raised by a loving family. We watch as she fights with her brothers, and her father teaches her how to hunt. These flash-backs are gracefully written, giving the reader insights into Sonja's background, and helping us understand who she is as a person. We also see her family attacked and killed by the followers of the same god whose minions Sonja battled in the first story arc. And along the way, Sonja's footsteps are dogged both by the girl she saved, and by a mysterious hunter. As the series progresses, Sonja and her partner attack the bandits, and in the end they wipe out all but one, who the leave alive so he can tell others to stay away from the town of the Arrowsmiths. 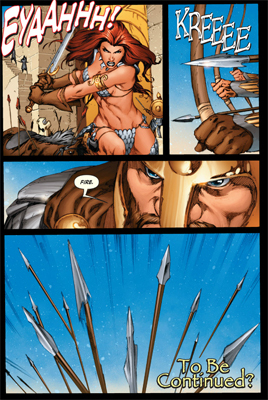 Once the girl leaves Sonja's side, the hunter appears again, ready to attack and kill Sonja. It turns out he is a servant of Borat Na-Fori, the same deity served by the celestial, and is out for revenge after the happenings of the first story arc. He battles Sonja, and her old friend Osin (from the first story arc) shows up to assist her. At the end of the arc, a giant mammoth runs through the area, causing an avalanche, which separates the hunter from Sonja and Osin, thereby stopping the battle. Where the mammoth came from is explained in the next issue, which begins a new story arc for Sonja and Osin (and will be reviewed with the Year 2 comics at a later date). I found first year of this series to be absolutely outstanding. The writers, Mike Carey and Michael Oeming, do an outstanding job of characterization. The dialogue crackles with energy. Sonja is written with a perfect mix of toughness and heart. The villains may be cruel, but they are not mindlessly evil -- they have believable motivations. And there is enough ambiguity to the unfolding plot that, although you're always on Sonja's side, you definitely realize that her way of "fixing things" is extremely bloody and destructive. The Mikes clearly show that Sonja's win is a Pyrrhic victory. Overall, the story in this series started out stronger than just about any first story-arc I have read since returning to comics, with the possible exception of Batgirl. 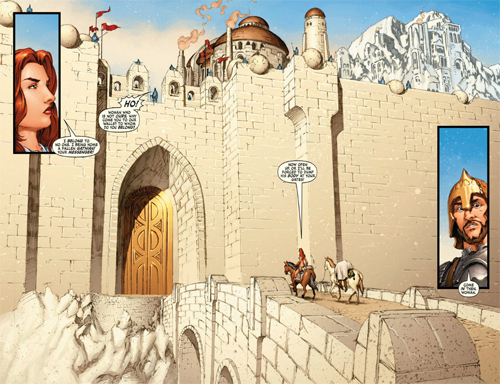 Additionally, the art was superb for the first year of Red Sonja. The book's main artist, Mark Rubi, who seems to do both the pencils and the inks, does a fantastic job with all aspects of the art. Rubi does a wonderful job with Sonja, who has a very expressive and (of course) lovely face, and the requisite killer body (literally). But it's not just Sonja who is done well. All the characters look unique and individual, and have interesting features and a wide range of expressions. Additionally, Rubi does an amazing job with the fight scenes. I often felt like I was watching a movie, because the scenes were so cinematic. And finally, Rubi does an excellent job with the backgrounds of the fantasy setting. And then there is the job that the various colorists have done on this book, which is simply phenomenal. All in all, between the high-quality stories, strong dialogue and characterization, and beautiful artwork, I can't say enough good things about the first year's worth of Red Sonja. This run by Carey, Oeming, and Rubi is simply wonderful, and ranks up there with Gail Simone's Batgirl and Simonson's Thor. And that's saying something. I know the creative team will change as I go along, but I will definitely be reading Year 2 of this exceptionally good series.